So, that being said – I take fluoride seriously. I hate the stuff. But, aside from the emotional aspect of fluoride, there is also the medical side. Folks, fluoride isn’t good for you…it’s toxic stuff. You don’t often hear me come right out and say things like that…but I really believe this strongly. If fluoride is toxic, then why on earth is it in our water, our toothpaste, vitamins, and mouthwash? That’s an excellent question. It seems the ADA thinks that fluoride aids in the prevention of tooth decay…the truth is, that’s never been proven. Several countries have rejected the use of fluoride in the water system: China, Denmark, Norway, Sweden, etc. I hope the United States wises up and follows this protocol very soon. Because Barry and I feel strongly about drinking safe water, we saved up and purchased a Royal Berkey Water Filter last year. After researching, we felt that the Berkey was the best option on the market. When we did so, we did not buy the fluoride elements – the filters that remove the fluoride. Why? Because several of the homes we were looking to purchase didn’t have town water – they had wells. When we moved and inherited town water, we knew we’d be buying the elements to remove fluoride. However, one of my favorite companies, More Than Alive offered to send me a free set of elements to try. I was tickled pink to work with them again! They’re really fabulous with great customer service. We don’t taste any difference in the water…it’s just my peace of mind, knowing the fluoride is gone. 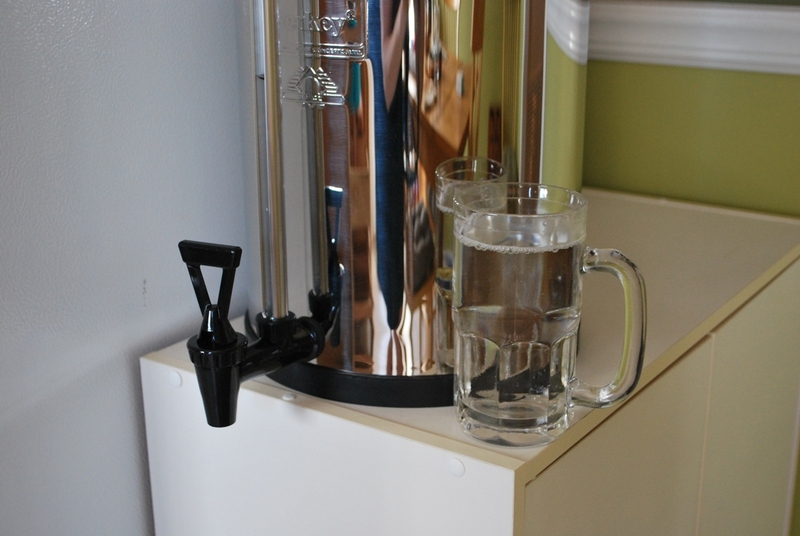 I highly recommend the Berkey Water Filter Systems and the fluoride elements. I feel a great comfort knowing that Annie and Bean are drinking SAFE water. NOTE: I am not a doctor…all I know about the dangers of fluoride are things that I’ve read and the experience that I have with my own teeth. Do you own research and make sure you reach a conclusion that makes you comfortable. This is so cool! A very fabulous giveaway! Thanks for sharing this post! I’m not entering the giveaway, it’s over and I’m in Canada. Am saving up for a Berkey, though. It was your comment about the flouride deposits on your teeth that got my attention. Both my brother and I have them and neither of us smile without hiding our teeth. I finally had bonding done several years ago, which helped some, but it has had to be redone twice so far and I need to have it done again. Each time costs more than a Berkey, and I have had a lot of problems with a less than perfectly smooth finish which tends to stain. We also both have developed a lot of other problems with our teeth, mottled enamel, etc., much like what I saw when I googled flouride deposits. I didn’t realize what the white marks were called. I already mistrusted flouride enough to (adamantly) refuse treatments for my children, and, surprise, surprise – at 18 and 21, neither has ever had a cavity, and no white spots. Coincidence? I think not. The damage – physical and psychological – has already been done to mine, I’m trying to remineralize now to salvage what I can. I’m not a doctor either, but growing up on well water my dentist insisted on lots of flouride treatments and flouride toothpaste. My parents (pre-flouride) have nice teeth in their eighties and my children (flouride free) have nice teeth. I had flouride treatments and I have hideous teeth. I NEED one of these!!!!! I have heard about these and have been reading up on them!! These filters look wonderful! With my family of 6 it would be a HUGE blessing! I call water my “clear gold”. I love it! And I agree that flouride is bad! I’d love to win the Berkley water filter. Thanks for this giveaway! We need one of these so badly! Would love to win the Berkey. I agree that fluoride is very dangerous! 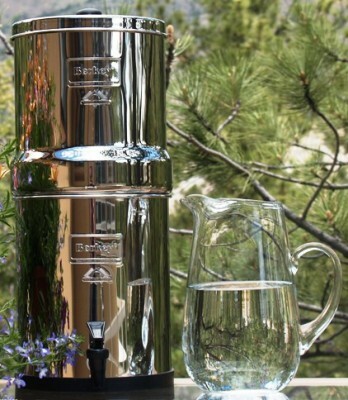 Entered your contest for the Berkey Water Filter. I checked out More Than Alive website. Very interesting research. Made me think about water and what is in it. Thanks for the eye-opening facts on fluoride and water. I would love to have one of these filters! I have the same fluoride concerns as you. Super giveaway. Hope I get picked, it would mean so much. Sounds very good to me. At my last dental appointment they wanted me to get a fluoride treatment but I declined. I do not like it either. I have never heard of floride deposits. Do I live under a rock? The rafflecopter is working right now so I MUST come back to register! When I reached a ‘certain age’ (old) I began to develop sensitivities. For a time there was a new malfunction of my body every few weeks. I did the research and made lifestyle changes. One of the most hidious reactions to products I had used forever was a burning/blistering of mouth and gums when I used a certain type of toothpaste. I switched brands a lot during those miserable weeks. I finally started to look at the ‘ingredients’ not the brand as the possible culprit. More trials told me that fluoride was my ‘battery acid’ culprit. I found baby toothpastes to be safe but not enjoyable. Then I discovered “Tom’s Of Maine”. They have several formulas without fluoride. Trader Joes also carries a house brand with no fluoride listed. I share your concerns about drinking water with ‘rat poison’ added. On that note , I shall thank you for the oportunity to learn about the Berkey Water Filter. How very wonderful is that! What a give-away! I think, though, if I am chosen to receive this, I’d like for Annie to put her precious little finger prints on mine–too soon those little fingers grow up and are off and out of the house! Have a blessed day! O my goodness my heart jumped when I saw this giveaway! My family has been wanting one of these for SO long – thank you for the opportunity!! 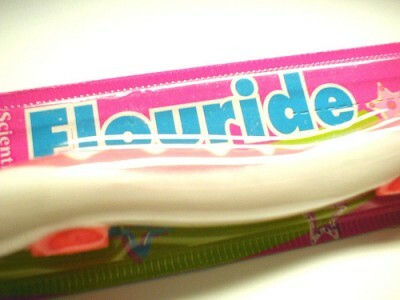 You may think this question is weird, but is there a difference between the floride in toothpastes, etc. and natural occuring floride? The reason I ask is because I read somewhere many years ago that the reason they started putting floride in things was because it was investigated why children in a much less developed country, who didn’t have any dental care whatsoever (or toothbrushes), had exceptional teeth with no cavities while children in developed countries who had good dental care, regular check ups, etc. would get cavaties….. The investigation found that there was floride (naturally occuring) in the drinking water source…. Shawna, I would love to answer this for you…but I really have no idea. 🙁 The only thing I do know is that research hasn’t really proved that added fluoride stops cavities. I am so sorry that you had a bad time with fluoride. My husband is a dentist and for the past 31 years, both of us have been carefully studying fluoride. Anything is toxic if done incorrectly–even water. I encourage everyone to talk to their healthcare professionals before considering a fluoride filter. That sounds like a great water filter! Thanks for the giveaway! Great giveaway! Our new house, on 5.5 acres, is about done. Not sure how the well water will be and all the filtration we’ll have to do. I am also aware of how we are being poisoned with fluoride. That’s why fluoride toothpaste tubes say not to be used by those under age 2, those 2-6 to use no more than a pea size (to minimize swallowing) and if more that that amount swallowed to get medial help or call poison control right away! We live near a major river, which is loaded on both sides with numerous chemical plants and we too have “town water”. Our home has a water distillation unit, which removes EVERYTHING (distillation is not the same as filtered), which is why pharmacists use it to mix medicines and it is used for contacts, etc. We just use the distilled water to cook and drink. We don’t have our home “wired” for distilled water to go to our shower, toilet, wash machine, etc. distillation removes everything, you are right. this includes minerals, which you need from your water. the berkey filters do not remove minerals. distilled water actually leaches minerals from your body- if you drink it long enough you will end up with mineral deficiencies. switch to a berkey! Hi Stacy! Hope ya’ll are doing well! Thanks to you and More than Alive for this generous giveaway! Blessings from Bama! Great Information Stacy – I love learning new things. I’ve been wanting one of these for a while now, but I keep procrastinating on taking the plunge. I’d love to win! We’ve recently moved from well water to city water. I teeth have become sensitive from the water so, I’ve been driving to a natural spring and collecting water. Would enjoy winning this giveaway! Would love to win this. Been looking in to buying one and saving up for it. We are saving until we can pay CASH! Entered every way possible! We have been eyeballing these! Exciting giveaway! Thank you, Stacy! I have small children ar home and would love to win this for their benefit and mine. Oh geez, I hope I win!! !